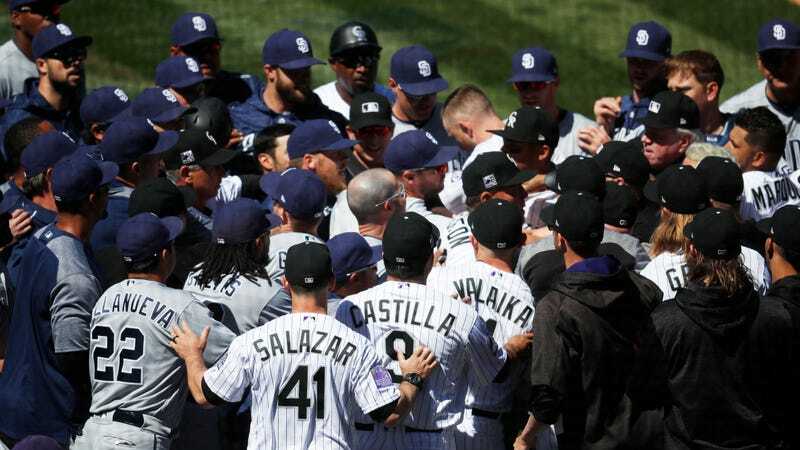 The Padres and Rockies are playing a game in Colorado today, and things really went to hell in the third inning after Padres starter Luis Perdomo threw a fastball behind Nolan Arenado, sparking a benches-clearing fracas. The context here is that the Rockies hit Manuel Margot with a pitch in the ninth inning of last night’s game, and then hit Hunter Renfroe during today’s game. That was enough to convince Perdomo that he needed to uncork a heater at Arenado, which in turn was enough to get Arenado charging at the mound.